Happily, we managed to do all the things we set out to! Unfortunately, I didn’t have enough time to walk around in circles to get my GPSr to show those coordinates!! However, it was fun seeing the coordinates keyed in to my Garmin nüvi! The cache itself is a big ammo can hidden in the trees just off a road. It has a huge number of favourite points (1,401 at the time of writing this!) and has had a huge number of visitors too. 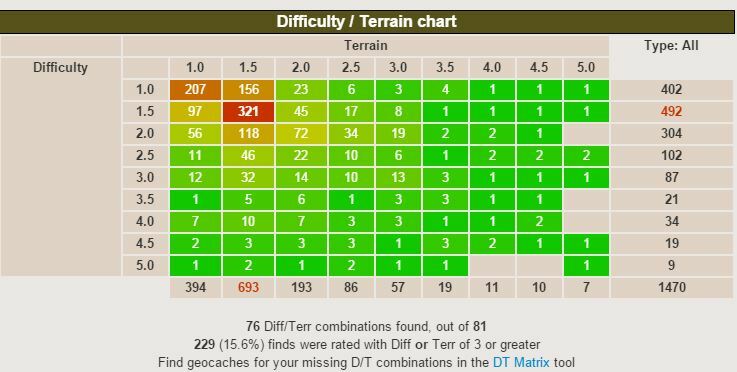 When planning my trip, I had a look at what DTs I still needed, via the Map DT Matrix on Project-GC, and noticed a 4/4 mystery cache in the centre of Leuven. The puzzle didn’t pose too much of a problem for me to work out. When I had figured out the final coordinates, I looked on Google Earth and saw the reason for the T4 rating. The cache is hidden along a motorway, up the top of a ladder leading to those direction signs that hang over the road. On our last day in Leuven, I decided we should try to find the cache, since I had done the work on the puzzle. We parked at a breakdown spot 400 metres away and walked (very quickly!) back to GZ. 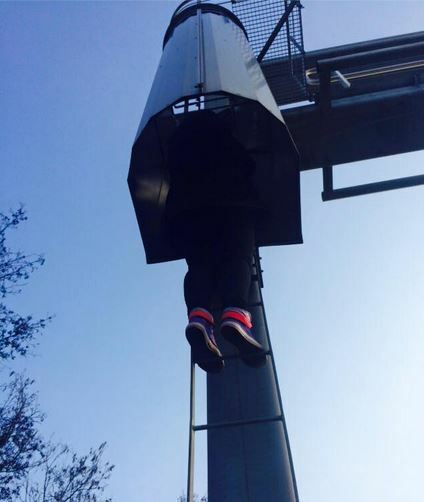 I climbed the ladder without even thinking – I just wanted to get out of there as fast as possible in case we were questioned by the police (my lack of French or Flemish could have posed problems!). I climbed up and never looked down – it was extremely high!! I searched and searched for the cache, hanging on to the ladder with one hand but found nothing. I carefully made my way back down. I was so disappointed. Just when we were going to go back to the car, I noticed something lying on the ground. The cache! I was overjoyed after all the effort. The cache must have blown down, which makes sense given how high up it was. Very pleased to get my name in the log! On the way up – don’t look down!! Project-GC DT Matrix – only 5 left to find!! My original plan had been to do 3 countries in a day – simply because I could then get the Luxembourg and Netherlands souvenirs. When I mentioned this plan on the Geocaching Belgium Facebook page, a few people suggested I should do 4 or 5 instead. So I did a little research and decided 5 would definitely be doable. We set out at 8.30am on Saturday from Leuven and drove straight to Fromelennes in France, where we found the first cache of the day just over the Belgian border. 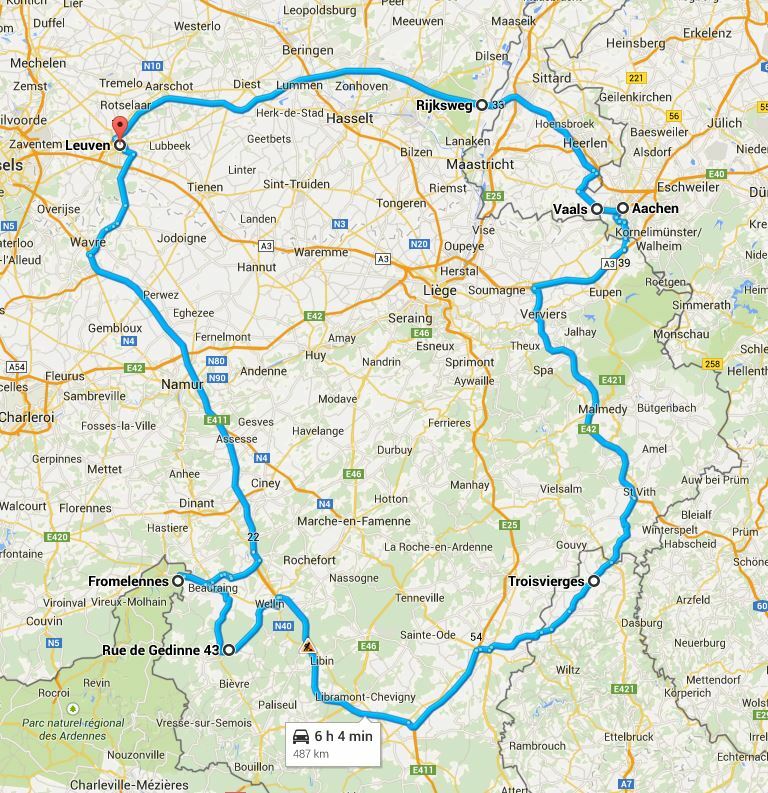 From there, it was on to GC40 in Belgium. The third stop was in Luxembourg, close to Troisvierges, where we picked up three caches, including an awesome Travel Bug Hotel (GC48MW4 Patascha’s TB Art-Hotel). We stopped in Luxembourg for a spot of lunch in a very fancy restaurant (because it was the only one we passed by!) before hitting the road to Germany. On the way there, we stopped at two Earthcaches in Belgium and another traditional, just for good measure! Then it was in to Germany, just outside Aachen, for two caches, before crossing the border in to Vaals, Netherlands and picking up five caches. The last cache of the day was in Belgium and it was a challenge cache, where you had to find 5 countries in a day – the perfect end to the day! (GC2VNG2 Challenge: The European Cacher). We arrived back in Leuven at about 7pm, having found 16 caches. It was a great achievement. I’m not sure if I will ever better it and do 6 countries in a day, but you never know! 5 countries – one day – over 500km driving! Happy with my new stats! On the Sunday of our trip, we spent the day in Brussels, taking in the sights (which mainly consisted of urinating statues?! ), picking up some great caches and having a small Meet & Greet type event (GC5NR06 Meet the Irish – Brussels 2015). My favourite cache in Brussels was GC5M5MG The Letters on the Wall – a mystery cache where you had to walk up and down a shopping street, looking for the shops containing the letters in the picture given. A great idea, and one which I may pay homage to in a cache of my own in Ireland. On our last day in Belgium, The_Mother and I headed to a park just outside Leuven city centre, called Provinciedomein Kessel-Lo, where there was a series of 11 traditionals, plus an Earthcache and a Wherigo. We managed to find them all on a leisurely walk around the park and every single one of them was great! There was such a variety of hides and containers, and they were all very well maintained. 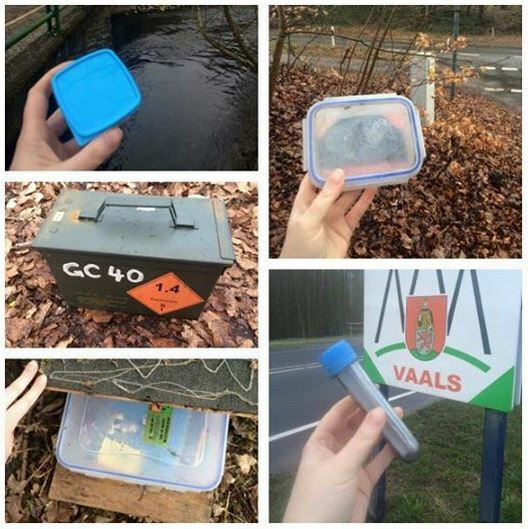 It was a pleasure to find them all, and a big THANK YOU to Turfje65 for placing the great series of traditional caches for us to find! I was nearly cleared out of favourite points by the time I finished logging! It’s nice to read about the adventure a person has while caching as opposed to just reading the log. I look forward to your future posts. Nice job on the site. So fun to read about your adventures! I’m coming to Ireland this summer for the first time! 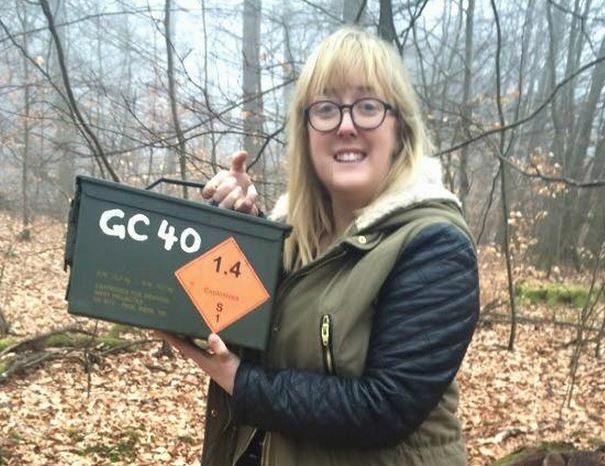 I’d love to have someone to meet up with and do a few caches! Hi Jodi! Thanks for your comments. 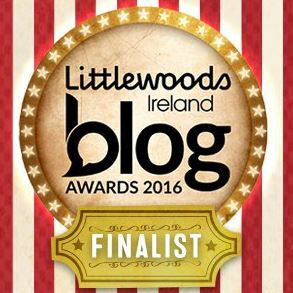 I have lots of blog posts about my favourite caches in Ireland – you should check them out. Maybe we can meet if you have an event while you’re here? Sounds like an awesome day of geocaching #jealous. Can’t believe you found that mystery cache on the ground, what a stroke of luck. 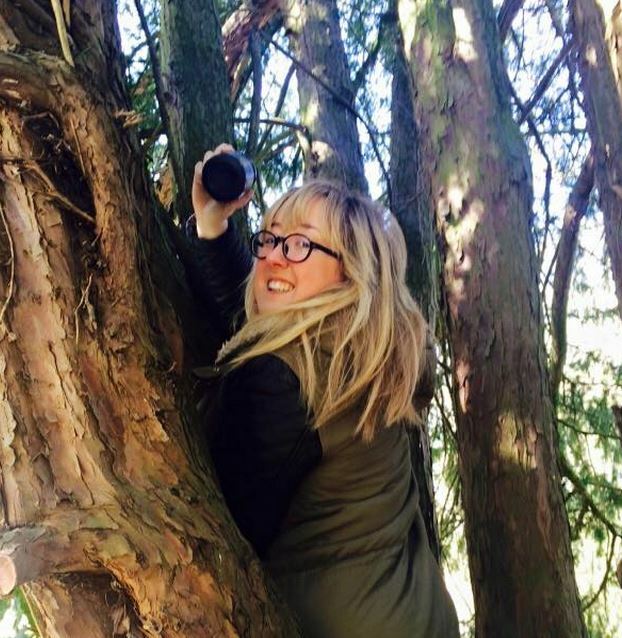 Awesome to find one of those really old caches too… an ammo can in the trees, my favorite 🙂 Thanks for sharing your adventures Sarah and congrats on your accomplishments! 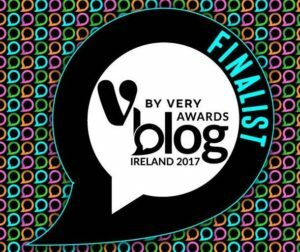 Hi Sarah, I really enjoyed reading this blog entry. I’ll be looking forward to further instalments. By coincidence I will be in Brussels in a few weeks, and when I checked the geocaching map I saw an event “Meet the Irish”. 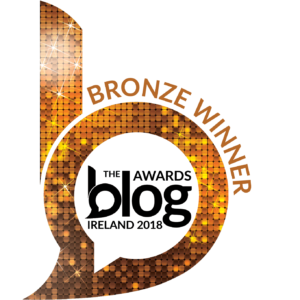 Of course I was curious which of my Irish geocaching colleagues it was, so I clicked on the event and saw it was you! Thanks Dara. Small world eh? Indeed. I always get a thrill out of seeing a familiar name in a logbook in a foreign country. BTW I didn’t really know about your blog until now so I’m enjoying catching up on your earlier entries. Thanks! Yes, you should do it 🙂 Hard to start but once you do, you’ll be glad you did! Just dropping back in to say that I followed in your footsteps by finding “Letters on the Wall” when I was in Brussels earlier this week. I was able to identify all the letters except the initial “B”, and was able to guess that one. A fun caching experience despite the fact that it was pouring rain. Central Brussels has a lot of interesting caches of various kinds!